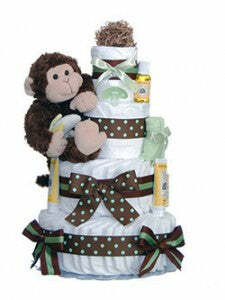 I thought it would be helpful to review our monkey themed diaper cake offerings in a single blog post as this is one of the most popular baby themes. We have three different monkey themed baby diaper cakes. Any of these would make a unique baby gift or baby shower gift for the new or expectant mom. The first is our Lil Twin Monkey 5 Tier Diaper Cake, the second is the Our Lil Monkey 4 Tier Diaper Cake, and our third is the Welcome to the Zoo 3 Tier Diaper Cake. Let’s get started with a overview of each design. Lastly, we finish up the design with two Gund Mambo Junior plush toys. I really like Mambo and this little guy is 10 inches tall and very soft and cuddly, a characteristic of all Gund plush toys. He’s holding a banana which really adds to the overall design look. This baby diaper cake consists of 70 Pampers Swaddler diapers arranged in a 4 tier design. We use green and brown polka dot ribbon to dress up each layer of the cake. Also included are two wash cloths, a silicone pacifier, and the Burt’s Bees Getting Started Kit, similar to our 5 tier twin cake. For this design I am using the full size Mambo who measures 14 inches tall. He’s holding a banana just like Mambo Jr., and it every bit as cuddly. We often get questions about whether or not all the diaper are usable. For all our diaper cakes, we hand-make each one so that the new mom can easily disassemble the diapers from the cake and use them as if they just came out of the package. In this design, the new mom will receive 70 usable diapers that she can use for the care of the new baby. We never use pins, tape, or any material that could damage any of the diapers. Our last addition is Welcome to the Zoo. I wanted to branch away from the darker browns and create a design that has a different color scheme yet still features a monkey plush toy. This diaper cake starts with a three tier base cake designed using 40 Pampers Swaddler 1-2 diapers. Instead of the brown and green polka dots used on the previously mention cakes, I am using a cream colored baby zoo animal receiving blanket. This blanket has baby zoo animals such as a giraffe, monkey, lion, and elephant arranged in an alternating fashion. I add a simple green ribbon around the blanket for an accent. The middle layer uses a wide off-white ribbon along with a “Welcome to the Zoo” decal to support the overall design theme. The Gund plush toy on this baby diaper cake makes animal sounds when you squeeze him. As such, his name is Animal Chatter (clever!). Lastly, the top layer gets the same off-white ribbon as the second layer plus a green bow and silicone pacifier. I finish this baby diaper cake with Johnson and Johnson travel pack products featuring their body wash, baby powder, and baby shampoo. 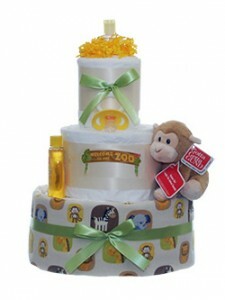 So that’s the overview of our monkey themed diaper cakes. This theme is very popular for a baby’s nursery and as for baby shower themes as evidenced by all the bedding, decorations, invitations, and baby shower accessories that are available. 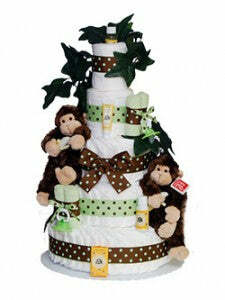 I invite you to consider one of our monkey diaper cakes as an cute and adorable baby gift for the new mom. As always, your comments are welcome.